Gilberto L. Vigo, M.D. is board-certified by the American Board of Internal Medicine, and practices Internal Medicine at White-Wilson's Fort Walton Beach Clinic. Dr. Vigo specializes in adult primary care; chronic care management; wellness exams; annual physicals; hypertension; and thyroid management. 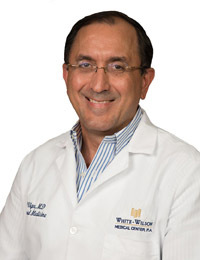 Before relocating to the Emerald Coast, Dr. Vigo was a physician in the United States Army. During his time serving his country, he received the Army Commendation and Army Achievement Awards. Dr. Vigo is passionate about people and providing quality health care. He is fluent in Spanish, and when he is not working, he enjoys spending time with his family. The Patient Satisfaction Rating is an average of all responses to the care provider related questions shown below from our survey. The Patients that are treated in outpatient or hospital environments may receive different surveys, and the volume of responses will vary by question.